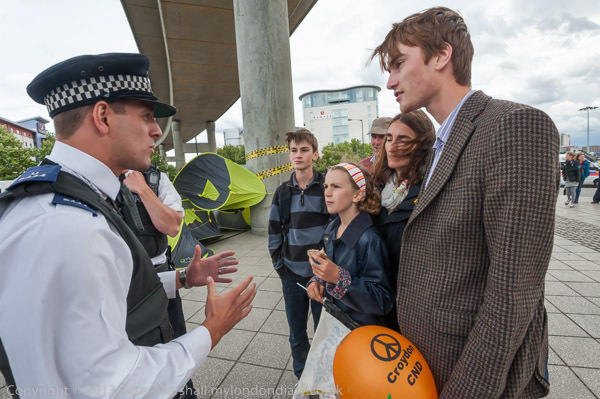 I was surprised to be reminded as I write that it was two years ago yesterday (October 15, 2011) that Occupy London tried to set up camp at the Stock Exchange and ended up in front of St Paul’s Cathedral, having been repulsed by an injunction and a large force of police. 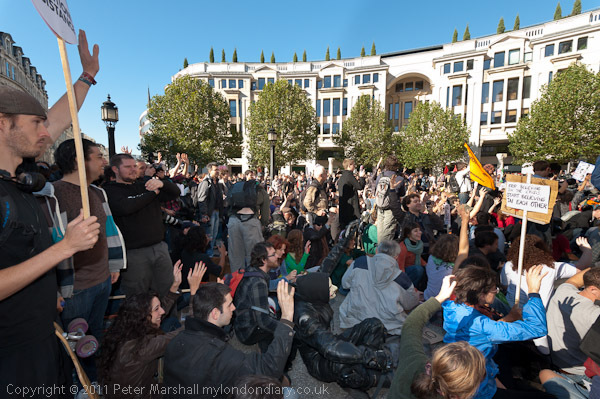 Occupy London lasted the longest of all the occupations, and along with the others did change the way we think about many things, something that is still working itself out. The actual decision – lots of people putting up their hands – didn’t make a great picture, but perhaps is an important record. Last month the Stop the Arms Fair coalition of around 25 groups, including the London Campaign Against the Arms Trade (CAAT), Disarm DSEi and East London Against Arms Fairs, supported others including the remnant of Occupy London and Quakers for Peace set up a temporary occupation on a roundabout next to the East London Arms Fair, DSEi. 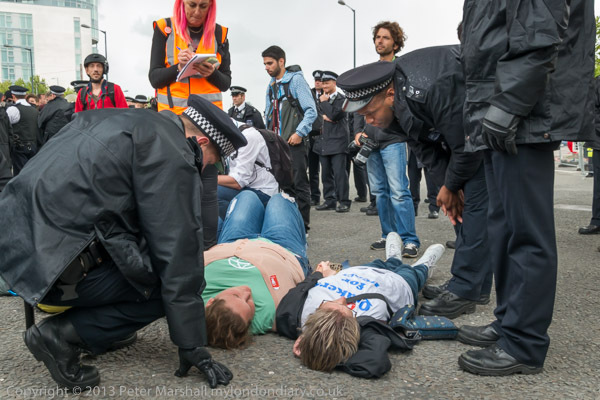 You can read the story about this at Occupy vs the Arms Fair. 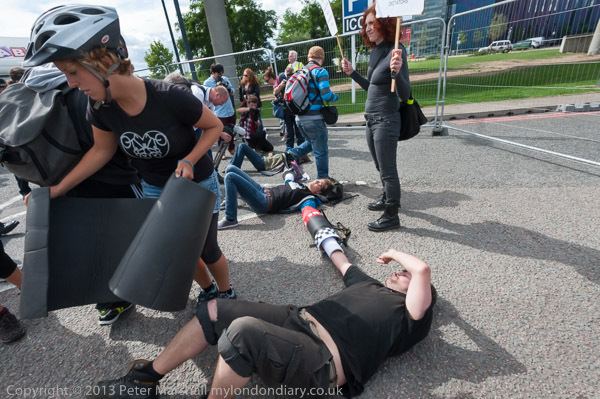 I’d lagged just a little behind the leading members of the group that walked and trotted up the paths a few hundred yards from the Prince Regent bus stop to the roundabout at the eastern entrance to the ExCel centre where the arms fair is held. 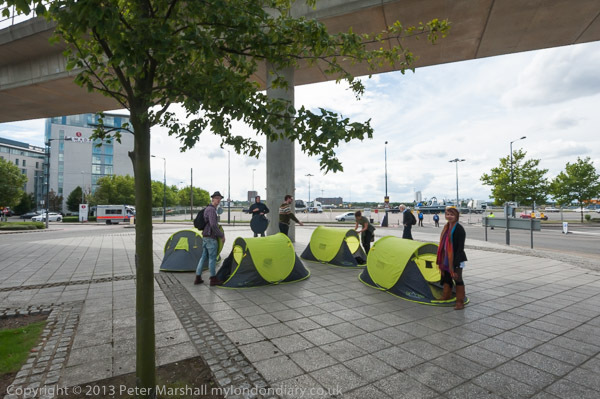 Some of them had the advantage of knowing where they were going and I let myself be a little distracted by the other things that were happening, photographing the people with banners and taking my eye off the ball – or rather off the tents. I would have liked to be there when the first few were erected, but was a few seconds late, running through an overgrown flowerbed just seconds after I’d seen them appear. Though I think I was still the first photographer on the scene. Shortly afterwards I also missed the group of three protesters locking themselves together in front of one of the gates, being distracted by the various things happening, which were probably planned to distract the police. Cyclists from the Critical Mass ride that had come from Bank in the centre of the City were going around the roundabout, a group of dancers were performing and more tents were going up and I was talking to a unicorn when I realised something was happening by the gate. I still got there some time before the police photographer. I didn’t find it an easy event to photograph. It was largely messy with not a great deal happening. 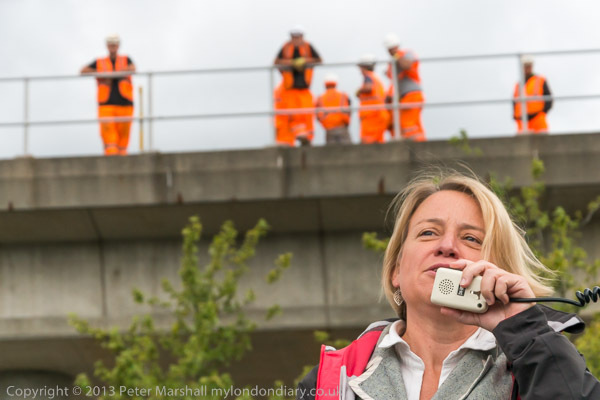 After an hour or so there were a few speeches, including one by the Green Party Leader, Natalie Bennett. The policing was restrained, with officers just standing back and watching for several hours before they decided it was time to do something. At first around 20 walked across and talked quietly to small groups of protesters, saying that the protest had been allowed to go on for some time and would people please now get off the road so that traffic – mainly to and from the hotels around the corner – could flow freely. To many of the protesters it seemed a reasonable request, and many complied with it, but then a small group decided to stay on the road, and sat down, then decided to hold a ‘die-in’, and others rushed to join them. The police retreated to rethink the situation. At first it looked as if the weather would resolve the situation, with a very heavy shower making the dead rise and rush for shelter under the DLR viaduct that ran across the roundabout. Then a few realised that the road was still fairly dry when it ran above, and started a second sit-down in that smaller area. Shortly after this, the police returned looking rather more determined and in a group. I got pushed off the road onto the roundabout, and got very firmly told I had to stay there even when I showed my press card, while other officers surrounded those sitting on the roadway. They were told they could either get up and leave or stay on the road and be arrested. A few journalists who had stayed on the opposite side of the road were able to photograph more closely, but a line of police prevented the rest of us from getting to those being arrested. I took the picture above kneeling on the ground behind that line, with my lens between the legs of two officers but was soon moved away by other police. Most left, but half a dozen stayed sitting or lying. 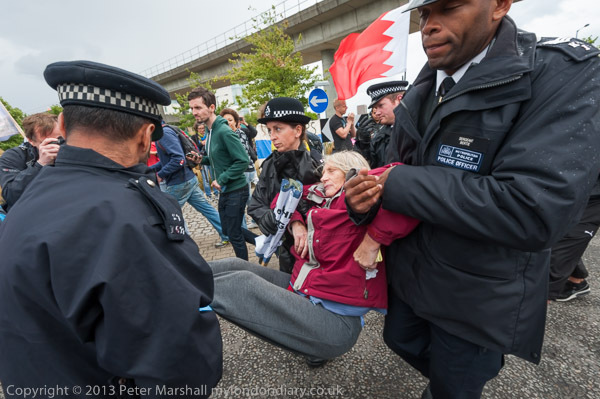 They were given a final chance to leave, then arrested and either walked out or if they refused to walk, carried across to a neighbouring grass area, where they were briefly searched and then cuffed and taken to waiting police vans. Other than a little lack of co-operation by the police at this point, I’d had few problems with taking pictures. But there had been a few very heavy showers that had caused some disruption. As usual I was walking around with a handkerchief loosely balled in front of the lens filter to keep it dry between taking pictures, but I could only do this for one of the two cameras around my neck, with the other tucked inside my waterproof jacket. But you have to take the camera out to take pictures, occasionally allowing the odd raindrop to fall on the glass. You can see the result of this, with some yellow flare and loss of detail in the top of the tent to the left of the half-naked figure in the picture above. He was in the dry (though a strong cold wind was blowing) but I’d just rushed through a heavy shower to take the picture. I’ve done a little retouching, but the problem is still visible, and some other images were lost in a similar fashion. 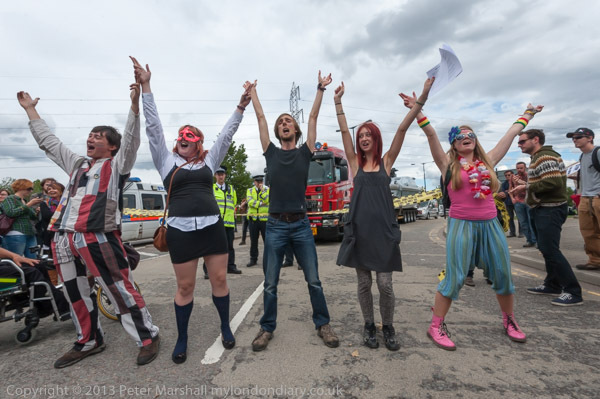 More pictures at Occupy vs the Arms Fair. This entry was posted on Wednesday, October 16th, 2013 at 08:03 am and is filed under My Own Work, Photo Issues. You can follow any responses to this entry through the RSS 2.0 feed. You can leave a response, or trackback from your own site.